Music lovers in Bengaluru have more reason to rejoice with renowned French pianist, Olivier Moulin, coming down to perform at Alliance Francaise de Bangalore on December 4th between 7:00 pm – 8:00 pm. The artist will pay tribute to artistes Hazrat Inayat Khan and Claude Debussy and the entry to the event is free. The French pianist is a laureate of the international competition Epinal, the price of Jeunesses Musicales de France, Maurice Ravel International Academy and he has also collaborated with several orchestras. 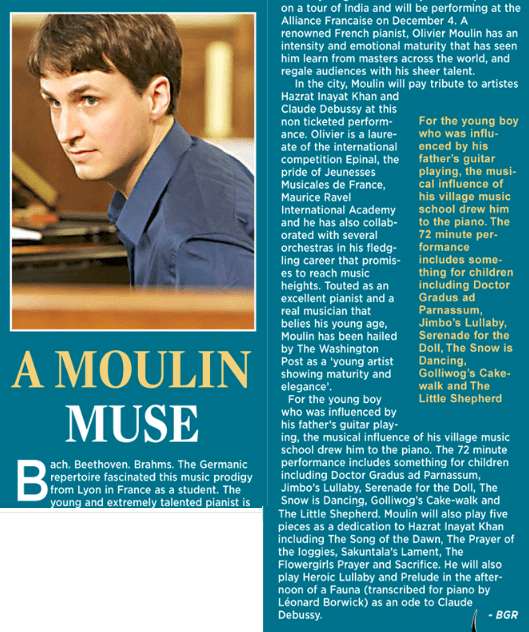 Touted as an excellent pianist and a real musician that belies his young age, Oliver has been hailed by The Washington Post as a ‘young artist showing maturity and elegance’. The 72 minute performance that will happen without any intermission includes something for children including Doctor Gradus ad Parnassum, Jimbo’s Lullaby, Serenade for the Doll, The Snow is dancing, Golliwog’s cake-walk and The Little Shepherd. He will also play five pieces as a dedication to Hazrat Inayat Khan including the song of the dawn, the prayer of the ioggies, Sakuntala’s lament, the flowergirls prayer and Sacrifice. He will also play Heroic Lullaby and prelude in the afternoon of a fauna (transcribed for piano by Léonard Borwick) as an ode on Claude Debussy.